VBCPS, with its high number of military-connected students, has many initiatives in place to help students and their families transition as they move in and out of the division. Thanks to the school division’s Military-Connected Academic Support Program (MCASP) grant, Corporate Landing Middle School (CLMS) students had the opportunity to meet Trevor Romain, a military dependent himself who travels around the world to speak to military children about his own life experiences. Trevor Romain speaks to students at Corporate Landing Middle School. The audience of nearly 350 CLMS sixth-graders roared with laughter. Romain, a native of South Africa and former reservist in the US Army, shared more stories with the audience, frequently using humor to connect with students. “It is so important to laugh to alleviate some of the pain/hurt even if it’s for a short time,” he told them. In addition to laughter, Romain talked about the positive effects that journal writing and doodling have had on his life. He explained that his doodles, including characters named Jack and Skye, later came to life in an animated film, With You All the Way. The film was created to help address some of the difficult issues unique to growing up in a military family and some to which all students can relate. Featured topics include: facing fears, deployment, dealing with bullies, coping with divorce, staying connected while being separated, understanding grief, and planning for reintegration. 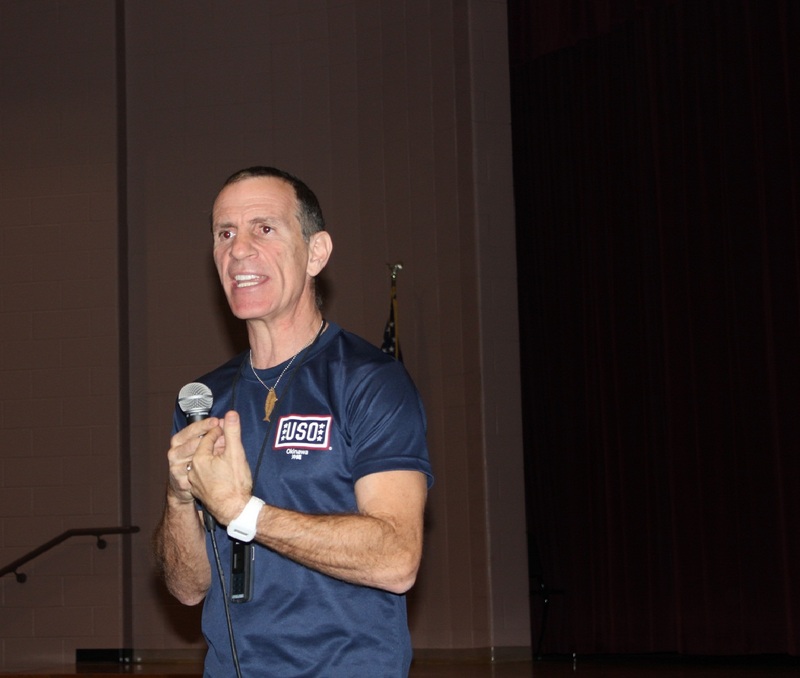 With support from the USO, Romain’s company is providing military-connected students in four of the grant schools who attended the assemblies a With You All the Way Empowerment Pack that includes the DVD series and tools for social and emotional fitness. After showing the animated film to the audience, Romain took questions from the audience and listened as students shared their own thoughts and experiences. CLMS has one of the highest military-connected student populations – nearly 33% – and students nodded in recognition of their similar experiences, questions and circumstances. To learn more about some of the school division’s programs and resources available at the schools to support military-connected students, visit vbschools.com and click on the “Military” tab.